Puto Pao. Puto is another popular Pinoy native delicacy. The original recipe of our grandparents call for cooked rice for the batter and using yeast for the leavening process which take several hours. Using all purpose flour and baking powder the long process is now eliminated. Puto can now be made instantly. The puto has evolved to countless versions they now come in various sizes, colors, flavors, toppings and are even made with filling. Puto pao is a cross of the Chinese steamed bun called siopao and puto. Here is my version of puto pao filled with ground pork and quail egg cooked asado style. For the filling: In a sauce pan stir fry garlic until fragrant, add in the ground pork and stir cook for 3 to 3 minutes. Add in red wine and stir cook for another 2 to 3 minutes. Now add in pineapple juice, sugar, star anise and 1 cup of water, bring to a boil and simmer for 10 to 15 minutes or until the liquid is reduce to half. Thicken with cornstarch diluted in 1/4 cup of water. Add in the boiled egg and stir cook for another 1 to 2 minutes. Season with salt to taste. Remove from pan and set aside. For the batter and steaming: In a big bowl, sift all purpose flour, milk powder, baking powder and sugar. Slowly whisk and blend in water. Now whisk in butter until fully blended. Fill the cupcake moulds to about 1/4 full with the batter. 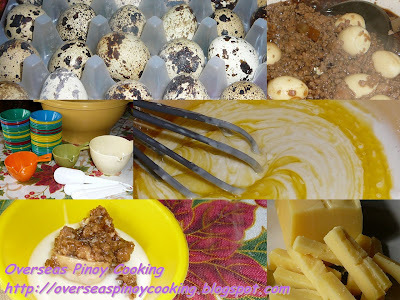 Put in the middle of the mould half quail egg and 1 tsp. of the filling then fill in more batter to nearly full. Top with strips of cheese and salted egg, keep aside. Repeat the process for the rest of the cupcake moulds. Arrange filled moulds in a steamer, place cheesecloth in between each tray to avoid water drips. Pour enough water and 1 tbsp. of vinegar on the steamer and steam for 20 to 25 minutes. Remove from tray and mould. Serve warm. See related rice cake recipe. Ang red wine ay lalong pinapalabas ang flavor at aroma ng nilutong pagkain. gumawa ako ng puto pao sinunod ko instruction s batter bkit hindi umalsa? bakit nag yellowish ang kulay?paano kaya maging white ang color?resulta p parang kutsinta makunat. Pag masyadong yelowish ang kulay at hindi umalsa na parang makunat na kutsinta ang ibig sabihin ay maaring hindi ka gumamit ng baking powder. Yong vinegar mixed sa steaming water ang nakakapag-papaputi sa mga steamed buns. pwede ba oven gamitin ko pagluluto puto pao, kung pwede paano at ano ang temperature? I have not tried it but a reader have tried it on my puto recipe and it got good result. Check it on Puto special post. ano po yung star anise??? Star shape sya na nagbbibigay ito ng aroma katulad ng katulad ng madalas natin naaamoy sa mg Chinese restaurant. Check mo yong pics nya sa Pata Tim post. Update from an Anonymous reader of Puto Special Post! You can bake the puto by placing in muffin pans @ 350 oven with a pan of boiling water underneath bake about 35 minutes, The pan of boiling water serves as the "steaming effect " during baking. Hindi naman huwag lang masubrahan. pwede pag wala okey din daman. gaanu po ang itatagal ng puto pao bago po mapanis? ilang araw bago po sya mapanis? Karaniwan pag inilagay mo sa ref. ang mga lutong pagkain ay umamabot ng 3 to 4 days. pwede po bang arena gamitin ko sa puto pao poz mix ko xa all purpose flour. Diko pa natry, baka di sya masyadong aalsa pag bread flour and gagamitin, siguro adjust na lang ang baking powder. thanks for your puto recipies. i try kong gawin sa bahay para pag may okasyon, may maihahanda ako, hehehehhe... more power to you and may you get more blessings for your kindess in sharing your stuff. para skin d best ang recipe dito.. Thank you po, lalo na sa feedback, please keep it coming so we can fine tune the recipe lalo na sa other puto recipes. Yes you can, just adjust the quantity of water accordingly. Powdered milk is supposed to be more concentrated, but you can always adjust the water to milk ingredient ratio. The moulds are sold on most major supermarkets in Metro Manila. Most likely they are not available in places where steamed rice cakes are not as common back home. Cup cake molds are good substitute. Wala po... all purpose flour lang talaga. do I need to put 1 tbsp of vinegar in steamer for every cycle of cooking?thank you. I would suggest use fresh/new water with vinegar for each cycle. pwede bang hindi lagyan ng red wine at star anise? merun bang ibang alternative n pwedeng maging sangkap kung sakaling wlang red wine at star anise? You can omit the red wine..
You may also omit the star anise kaso mawawala yong aroma ng asado. Try mo sa spice section of any supermarket, almost all the supermarket that I have visited ay meron. Bro. ut-man, I think some of your readers/fans...are looking for the regular Puto'ng Puti. Here's a quick recipe I learned from my mom. I think it's the "old" ways of making PUTO'NG PUTI. hi this is ria, ask ko lang sa paggawa ng puto pede bang gumamit ng rice flour instead of all purpose flour? first time ko gagawin yung recipe mo. I have not tried this recipe with rice flour, i hope some of our readers could help. Can I replace the powdered milk with evaporated milk?...what would be the measurement? 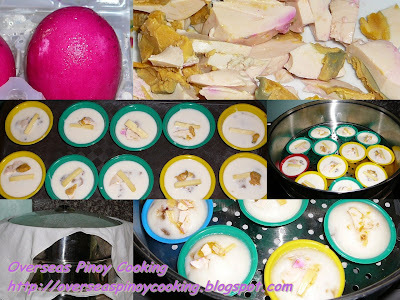 i tried the other puto pao recipe i followed the exact procedure and measurements the puto is yellow in color the puto is bit hard/ i used self raising flour aswe do not have all purpose flour nor cake flour. what do you think i did wrong the puto tastes like puto but it's hard..
Wow puto pao! I remember I always eat this when I was in elementary. Tuwing labasan lagi akong bumibili niyan. Hehe...Namiss ko tuloy kumain nung makita ko to. I am sorry I could not help you, I have not tried using self raising flour myself either, I hope some of the readers can help you. tnx sa recipe nyo more power! Diko pa po nasusubukan maglagay ng egg whites sa puto. Di naman pong kailangan malakas ang apoy sa pag steam, kailangan bahagya lang kumukulo yong tubig para sumingaw at mag-steam. Pwede po nd gumamit ng red wine sa puto pao..
Hello po! Thanks so much for this recipe. I made puto pao this afternoon using this as my guide and my husband loved it! I just added 2 tbsp of sugar and 2 tbsp of soy sauce. I wanted mine darker and sweeter kasi. :) Didn't put rice wine also coz I made a mistake buying the rice wine vinegar instead. Hehe. what if walang cheesecloth? may iba bang option? hi, wala talagang egg yung batter mixture? Hi pano mapalamboy ung mixture?ive tried it,ok nmn sya,kya lang ms msarap cguro kung ms malambot ung puto.